When I have trouble finding inspiration for a project, I will turn the project in to a joke. So I decided to make a remix of the theme song to my favorite show; Spongebob. The original song is light and playful. I wanted to replicate this mood so I chose instruments that reflect those qualities. The main thought I had was “How can I capture the sound of childhood?” The oboe has a resonant, nasally sound similar to Spongebob’s voice so I used it as my lead. I chose a deep, rich bass and a playful organ for the syncopated chords. I chose a light wave pad for the descending riff to make it dance above the rest of the composition, emphasizing this by boosting the treble and reverb so it floats, swaying between the right and left ears. Additionally I added quirky sounds in the drums like a laser and a cowbell. After this, I began creating little sample clips from the actual TV show. This is where most of the editing occurred. The samples didn’t sound lively due to poor audio quality. I fixed this by moving the threshold of the compressor just below where the sound is at the fullest. Additionally, I spent a lot of time sweeping the EQ to find where each character’s voice had the liveliest presence. It was tough trying to find the balance of where the samples sounded the clearest without causing any clipping in the master, but I persisted and found some sort of equilibrium. The next problem I encountered was that the song became quite repetitive after a while. I came up with a few solutions to this. I added and removed the recorded loops to add variation. Similarly, I added a bass drop with a buzz saw which is supposed to mimic the sound that the jellyfish make on the show (hence the title). Eventually I added a short B section and Added a quick stop in the middle of the song, which adds life to the piece by providing motion.From this project, I learned how hard it is to encapsulate the sound of the human voice to make it shine. It took a lot of trial and error to find the perfect spots and could have been ruined by simply going too far. Additionally I learned about perseverance because I messed up when recording and hastily dragged out the loops, causing numerous timing issues which took several class periods to correct. And even though it started out as a joke, I managed to create a piece of music that I made with intelligent, deliberate decisions. For this project, I used an A minor scale to compose my melody chords and bass. I used a lot of chromatics because I feel like it gave the song more motion. Since I used so many chromatic runs, I decided to use power chords since they are more ambiguous. I then based the bass line off of the chords, removing the fifth and adding contrary motion to the chords. Next I made a beat which I felt accented the song appropriately. I then took the chords and put them on a Vinyl Siren track and added an arpeggiator and an auto-pan so the arpeggio would jump around. My project started out with a guitar solo initially, but didn't fit with the song in the end. Additionally, I wanted to add a part with record scratching, but there was no record scratching noise on Ableton. So I created a record scratching noise with an Alchemy plug-in and put the solo in that track which sounded really interesting. I again added an auto-pan to make the sound move around. One major problem I had during the song was the bass would get so low that I couldn't hear it. In order to remedy this, I separated out the tracks, added a bit of delay to fatten the sound, and boosted the mid range of the EQ which for some reason made the bass clearer. For this project, I wanted to use pads to create a dark atmosphere. I chose a Stutter pad to make the chords sound uneasy when they play, automating the depth and rate of the stutter throughout. Next I added an EQ to make the instrument more clear, and then I automated volume throughout to keep the balance in check, I also chose a Bow and Chimes pad which plays a bell when the note is held, and a bowed cello when the note is sustained. I chose this because the twinkling bells can be used to give the song motion and create an unsettling, yet still remain somewhat grounded with the bow. I used the EQ to try to make the bells shine, but still give the bow presence. Additionally, I automated the volume of the bowed notes to make the not get louder as it starts to play, and get softer as the note tails off. I additionally made the song sound more eerie through the use of a wind pad which again helps to set the atmosphere. I automated volume to intensify this effect in some areas, and to set it in the background in others. I also used a velocity pan pad which sounds like a Pan pipe. I'm not sure how, but I managed to alter it so that when the note is quickly tapped it sounds like a shaker, and like the pipe when tapped harder and sustained. This allowed me to use this track for both rhythmic and percussive elements. I added an EQ to make the shaker sound more crisp and to add more punch to the pipe notes. Further more, I used a lot of half steps as they sound ominous, and added an auto-pan to make the sound come from random places.The image I was going for in my head with the use of these pads was someone wandering through a dark forrest in the dead of night. Next, I did what I thought was the most fun part of the project. I sampled sounds of Scooby-Doo laughing, and distorted that, adding a minor third down delay, and adding chorus to give it depth and make the sound more omnipresent. I loved the Scooby-Doo laugh effect because when played on a low note, the sample is played slower, giving a deep, full, demonic laugh. But when it is played higher up, the sample is sped up, making it sound more like a jittery goblin like chortle. I Then added an auto-pan to make the laugh hit the listener from different directions, giving the impression of being surrounded. It was difficult to EQ this noise as some notes were really low while others were really high, so I ultimately doubled this track so I could focus more on the highs on one and the lows for the other. I did a similar thing to a sample of Spongebob laughing. I added a minor third down delay and played it at various locations. When played lower, the laugh sounds like an old door slowly creaking open. When played higher, it sounded like grunting.Since the sample was weak, I had to bring the other instruments down and bring the Spongebob laugh up so it would be heard. Finally, I added a fade in and fade out on the Master track. My friend told me that the reason recordings fade out instead of having a definite ending is so that the song doesn't give you a sense of closure, making it more likely to be stuck in ones head. So I used this to make the song fade off into the distance and not give the listener closure. I would also like to add that rather than a minor pentatonic scale, I used a Phrygian scale. It has all the same notes as a minor pentatonic, but the minor second and minor sixth in the scale adds darkness. When selecting pictures, I looked up some questionable things on Google Images, including disturbing pictures, trippy disturbing pictures, creepy clowns, demons, cannibalism, brutal murder, disturbing artwork etc. However, I was going for a very specific look. I wanted creatures that looked more like dark sketches rather than defined. I feel like the lack of details gives the creature more ambiguity, making it more offsetting. Finally, when put in the slideshow, I edited some pictures to make them black and white or look more antiquated. I went through several revisions during this project. I think the best way to describe it was a subtractive process. I initially started with seven minutes of song and fifty something pictures. I narrowed down the pictures based on effectiveness in setting the mood versus resolution, as I was told that a lot of my pictures were low resolution. I also went back in to Ableton and starting cutting parts out of the song and eventually narrowed it down to four minutes and twenty slides or so. ​ When selecting my tracks, I decided to use the rubber band notes for my bass and transposing them up an octave for the chords. That made my song have a bouncy feel to it. I used chorus and a flanger to warm the sound up as it was quite dull. I used the puffy grape for my bass drum which had a soft sound that didn't resonate well, so I warmed it up to the best of my ability using some saturation. I used a chair for my snare and the spry bottle for the hi-hat. I warmed those up as well and the over all drum beat ended up sounding 8-bit. So when using the rubber band notes, I noticed that there was a flat fifth interval, which I thought was the coolest thing ever because I love the off putting sound of tri-tones. I learned about modes over the summer and decided to base my song around the flat five using a lochrian mode. That was a big mistake. It is extremely difficult to write music around a diminished chord, which is why the melody is so choppy. 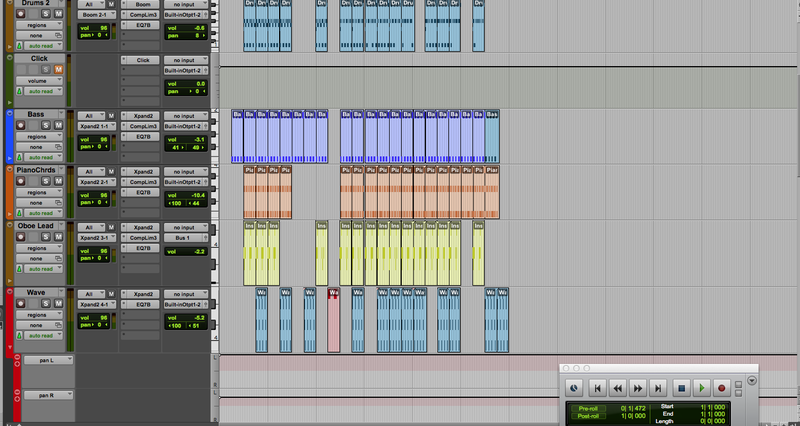 This ultimately ended up working well with the bouncy bass line, but I felt what I could do musically was limiting. It was quite frustrating. So frustrating in fact, that I decided to revisit my old friend, the screaming goat, as well as some other screaming sounds as I was screaming eternally from my frustration. I put the screams in there randomly and transposed them up and down to make it more interesting. We were supposed to remix Vangelis's "Chariots of Fire" from the movie. Unfortunately, I was in a bad mood when I was recording it, so I decided to have some fun. I learned how to use Simpler in Ableton and began Sampling the noises used for the A section. I sampled the screaming goat, Patrick Star, and Dr. Zoidberg because they're recognizable sounds and add humor to the song. The intro and all background music is improvised similar to how Vangelis improvised the music to this song. A problem that occurred was that I did not set the tempo before I started recording along with the original so when it came time to make the beat, I couldn't use the sequencer and had to record in arrangement mode as the song went on. That being said, I made the beat simple to avoid any terrible mistakes. 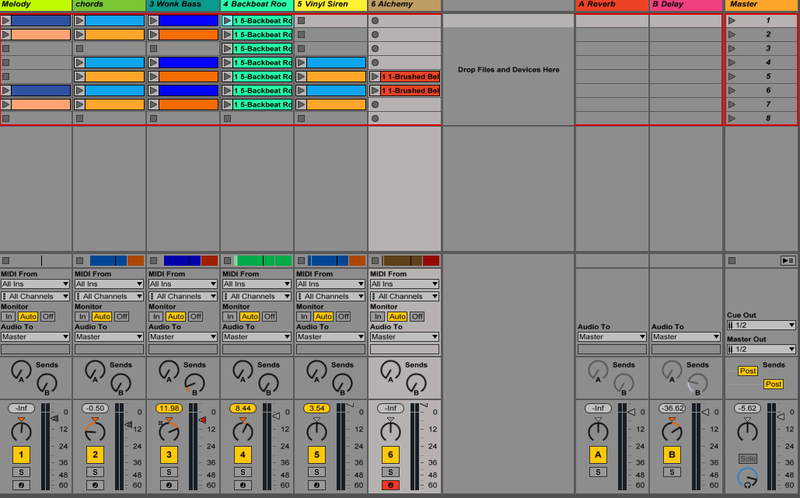 This was my first venture into Ableton Live. Transitioning into this program was quite easy as I have had experience with ProTools at this point. I loved using the push because it goes up in fourths so it's eaier for a guitarist to understand. The sequence function made beat making a breeze and I was able to complete this project fairly easily. This project was inspired by Ken Nordine's album Colors where he writes poems based off of the colors in a box of crayons and has a jazz quartet improvise on top of the poem. We had to select a color from a color wheel and write a poem and song to go with it. I started out by researching synesthesia, a neurological phenomenon where one is able to see colors when they hear a sound. I then started to listening to music to see which colors I would associate these instruments, noises, and frequencies with. The color I chose was called shy cherry and it looked like dried blood. The first thing I thought of was "why is Cherry shy?" and based on the color, I decided that it was because she was troubled. I then wrote the poem accordingly based on what I think would be going through the mind of someone like Cherry. Then came the guitar, which was the fun, yet surprisingly difficult part. The song, like the poem, was supposed to be abstract and to me that meant lack of structure which had me stumped. It was hard to think of something to do when you had nothing to base it off, so I took inspiration from emotion. In the mind of Cherry, there was disorder, which i what I attempted to capture. Using the guitar synthesizer, I created a deep, warped, sound. I added chorus and a bit of a flanger to make it resonate and capture this feeling of being surrounded, almost like you're drowning. I then decided to switch between long bends and quick sporadic runs in order to create disorder to add to the chaotic sound. This is the project was a constant battle between having so many different ideas, and being able to complete the project within a reasonable time. In terms of a script- well I didn't have one. I chose to improvise the dialogue in order to make it seem more natural, recording every thought that came to my head while watching the silent clip. 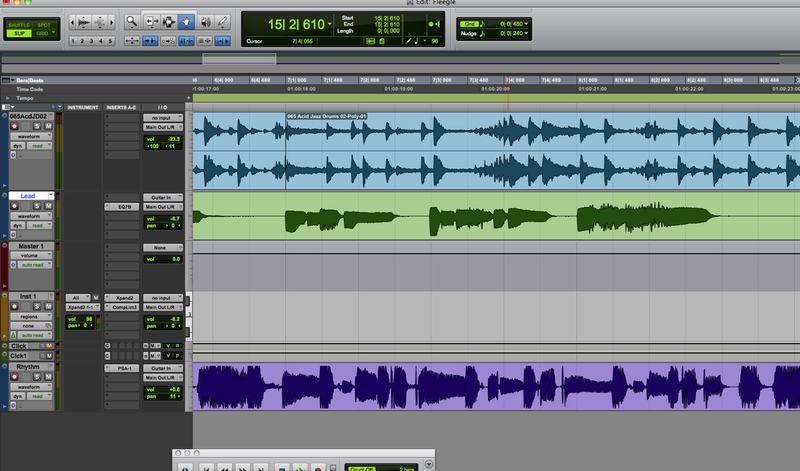 I used the Vacuum plug-in in ProTools in order to create all the noises you heard. Some clarification: the random beeping noises when the UFO first appears is supposed to be a form of communication between spaceships. The beeping when Klatu appears is supposed to be his heart rate, which is why it flat lines and becomes ridiculously high when he is shot. I cut out all crowd noises when Gort appears to create suspense, showing how the people were so scared and confused that they didn't know what to say. ​ Though I explored with synthesizers before in the first project, this was this project where I learned the joy of synthesizers. Before I saw electronic music as "press a button, make music" whereas after actually using a synthesizer, I view electronic music as "turn a knob, create infinitely different noises, and then turn it into something worth listening to". To me, it was like exploring with effect pedals to create the "perfect tone"
This was our area of inquiry project where we researched different types of electronic music across the world and came together to create a piece of music pulling inspiration from the artists we researched. I focused my research on guitar synthesizers and looked for people who have used them. The guitarists I ended up focusing on were Allan Holdsworth, John McLaughlin, Pat Metheny, and Michael Brook. Seeing as how all these artists were well versed in jazz (all but Brook is a jazz guitarist), I made my song jazz-based. Recording the song was tricky using the MIDI guitar. Something was wrong with the MIDI pickup which caused it to only pick up certain notes. This was extremely difficult to get around since I had no idea what was wrong. Ultimately,I ended up recording the chords in a guitar track rather than a MIDI for the sake of time. Fortunately, I had access to a GR-20 guitar synthesizer, and after using that, the project was a breeze! Since it was a jazz-based song, I started out using a horn sound which I then distorted slightly using delay chorus and reverb. From this project, I learned to appreciate electronic music.